On November 29, 2009, Rev. Tony Ponticello addressed the congregation at the Community Miracles Center in San Francisco, CA. What follows is a lightly edited transcription of that lecture. Thank you all for coming. As always it is a honor to be up here. It’s something I appreciate even more now. I don’t come up here as frequently as I used to since we’re having all of our ministers speak. So, my relationship to speaking and being a minister has changed. I actually find that I get more nervous now than I used to when I spoke more frequently. Strange, It’s a different season, so to speak, in my participation with A Course In Miracles, with my concept of being a minister, and with my participation here at the Community Miracle Center. I have been studying A Course In Miracles for a very, very long time. Actually, it has almost been three decades! Thirty years of studying the Course. I started studying in 1980, so I’m in my 30th year. Rev. Larry and I formed the Community Miracles Center in March of 1987. That’s almost twenty three years ago. That’s more than two decades. The CMC has gone through many different phases, different seasons. We once had five, maybe even six at one point, sessions of our class A Course In Miracles-1 going on here and at different locations. The whole class phenomenon has shifted and now we have only one session in A Course In Miracles-1 going on by telephone conference call. We also have one informal class going on here on Monday night. Once we did what we called Miracle Experiences, which were weekend retreats. We did twenty five of those. We frequently did them twice per year. Now we do these large biannual conferences. The last one, in 2009, had 418 people. It was very successful and we’re very happy to be the host organization for these conferences. Again, its indicative of these different phases, the different seasons that the CMC goes through. When I think of us going through phases, different seasons, I am reminded of something from the Bible, instead of something from A Course In Miracles. I am sure most of you know this passage. It’s from the book of Ecclesiastes. It says “To every thing there is a season, and a time to every purpose under the heaven: A time to be born, and a time to die; a time to plant, and a time to pluck up that which is planted; A time to kill, and a time to heal; a time to break down, and a time to build up; A time to weep, and a time to laugh; a time to mourn, and a time to dance; A time to cast away stones, and a time to gather stones together.” (Eccl.3:1-5) Now there many things you can say about this passage. It is an often quoted passage from the Bible. I think we ACIM students might, obviously, say this passage is about duality. It’s about the things that come and go. A lot of people say the Course is a non-dualistic thought system. I am always really interested when people define ACIM with words that don’t ever appear in ACIM. The term “duality” or “dualistic” is not a term that ACIM uses. I am always a little bit careful about defining the Course in terms that are not in the Course. There are enough terms in ACIM that we can use to define it. A Course In Miracles does imply that there is something amiss about dualism, about the coming and going of the things of the world. It says, “The cyclical, the changing and unsure, the undependable and the unsteady, waxing and waning in a certain way upon a certain path – all this is taken as the Will of God. And no one asks if a benign Creator could will this.” (Mn.Or.Ed.27.1) So when we see waxing and waning, coming and going, what’s talked about in Eccliesiastes, we have to understand that’s not the world God has created. That’s the world that we have created. I first became aware of this passage in Eccliesiastes, not because I was a Bible student or a good Christian. I first became aware of it, most of you who are around my age will know, because there was a very famous song by The Byrds named “Turn! Turn! Turn!” The song was based on this passage from Eccliesiastes almost verbatim, except after every few lines they would sing “turn, turn, turn”, as in the world turns and turns around. I was doing a little research for this talk, I was trying to find the exact year that “Turn! Turn! Turn!” came out. It was 1965, so I was 13 years old. As I was doing this research it was interesting to find out that The Byrds did not write this song. It was actually written by folk musician Pete Seeger in 1959. That predated The Byrds version by six years. That’s a little bit of trivia for you. It was not The Byrds. I was surprised. It was a folk song. Even though the passage from Ecclesiastes does not seem to be in line with A Course In Miracles, there is a way of interpreting it that I can tie in. It’s about accepting things. It’s about not getting pushed into the changes of the world. The world is always going to reflect these changes. It’s about us accepting that and finding something else that is stable, finding some surety, or some solidness, to base our lives on and then not to fight the comings and goings of the world. Ecclesiastes is a book in the Old Testament, not the New Testament, and its usually ascribed to King Solomon, who you see on the front page of your program. 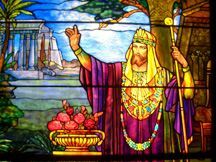 King Solomon is, of course, considered to be one of the most fair and honored persons of his era. Wise – you always hear wisdom associated with King Solomon. So, in his wisdom, he wrote this passage from Ecclesiastes, calling from us the acceptance of the comings and goings of the world. Ecclesiastes, itself, has a checkered past. It was once forbidden to be read by Jewish rabbis. The Jewish high priests thought that it was to cynical and depressing. So they outlawed it being read by Jewish people a long time ago, back in antiquity. Eventually it was put back into the cannon of the Old Testament Bible. A Course In Miracles again talks about this coming and going of things. It says, “The descent into hell follows step by step in an inevitable course, once the decision that guilt is real has been made. Sickness and death and misery now stalk the earth in unrelenting waves, sometimes together and sometimes in grim succession.” (P-2.IV.3.1-2) This seems to be what’s going on in my own life. There is a wave sickness and misery that seems to be going on, and this passage says that this is really caused by my guilt. My guilt is causing this. The decision that guilt is real has been made, and because of that decision sickness, death, and misery are being brought into my world. I am thinking about our friend Rev. Larry and the serious illness that he is going through and his challenges. (Rev. Larry was diagnosed with stage four pancreatic cancer in October.) I am thinking about our Minister Rev. Rudy Colombini who is still in critical care. He’s been in the same bed for over two weeks now recovering from a serious brain aneurysm. I’m thinking about my mother’s illness. She was rushed to the hospital a couple of weeks ago with a lot of mental problems and sickness. They still don’t know what’s going on with her. She is still in the hospital and she does not truly recognize me when I call her on the phone. So here is this idea that we’re studying a course that’s enabling us to heal the sick and raise the dead. That’s the idea that hooked me into studying A Course In Miracles three decades ago. I said, “Wow! I can study this Course. I can take a year and do these lessons and I will move closer to the reality of healing the sick and raising the dead.” That was my first phase, my first season. I was studying ACIM and I believed that as I did that, I would see substantial differences in my ability to heal the sick and raise the dead. At the age of 28 that seemed truly appropriate, but a long time has gone by since then. Yet ACIM seems consistent. Another passage says “Is it not madness to think of life as being born, aging, losing vitality, and dying in the end?” (Mn.Or.Ed.27.1) It is madness to think these things, and yet I see these things out there, So I am mad! I am crazy! That’s a tough thing to accept. When I was 28, young and vital, those healing ideas seemed good ideas to grab hold of. Now, I’m 57. I’m pretty fit for a 57 year old, but my hair is thinning. I can’t read without glasses, and my memory, never that good, is even worse than it ever was. I see that my body is going through its seasons and the phases that bodies go through. Yet I still believe in the absolute truth of these passages. With the phase of A Course In Miracles study that I am in now there is a reconciliation of the teaching. Maybe I have been looking at the teaching in the wrong way. Maybe there is another way for me to be looking at the teaching now. A couple of days ago I went to see Rev. Rudy and it was really sweet. He has a picture of me on the wall, and every other picture on the wall is a rock star. (Rev. Rudy is a rock musician.) He’s got a picture of me surrounded by rock stars! He’s got pictures of Mick Jagger, Elvis Presley, John Lennon, and me. I think it’s so sweet every time I see it. He’s in critical care. He’s not supposed to get to many visitors. In fact, I am forbidden to tell you what hospital he is in because the doctors do not want people just going there. The nurses that attend to him restrict the number of visitors he has. Every time I go in its a different nurse and they will ask me, “Who are you?” I say I am his minister and that’s my picture on the wall right over here. It was great that Rudy relates to me as a healer. That was a great thing to see, and it challenged my own idea, “Am I worthy of that picture on the wall” right next to Mick, Elvis, and John? Am I really that worthy? In fact, one time I went to see Rudy he asked me to put my hand on his head for a long time. He had a brain aneurysm and he wanted me to put my hand there. He perceived me as a healer, yet what’s my own perception? My own perception is challenged. Sometimes I feel I may even have failed A Course In Miracles in some way for these three decades, or possibly it has failed me. I have to deal with all of those thoughts as well. However as clear ACIM is about healing, the Course is also clear about the phases that we go through. This has been one of my favorite passages as well, and it is one that I use when I have these ideas of doubt. It says “Forget not once this journey is begun the end is certain. Doubt along the way will come and go and go to come again. Yet is the ending sure. No one can fail to do what God appointed him to do. When you forget, remember that you walk with Him and with His Word upon your heart. Who could despair when hope like this is his? Illusions of despair may seem to come, but learn how not to be deceived by them. Behind each one there is reality and there is God.” (Cl.Ep.1) We can have these illusions of doubt. We can have the illusions of, “Did I fail?” “Is it failing me?” We can have illusions of “Is this a valid course that I have been studying or have I been wasting my time?” Yet that is part of the process as well. I am entering into a new season of my study of A Course In Miracles. One thing that I realize is that I have never given as much time and effort to my daily lessons as I am doing now, because I seem to need them so much. I have got them written down in my journal that I keep everyday. I write the lesson down every morning. I’ve got them on my iPhone. Every time I look at my appointment calendar my lesson is right there to look at. I got the entire Course on my iPhone. When I do the lesson of the day I usually read it two or three times. It takes me that repetition to let it sink in. I do a mediation in the morning. I do a meditation in the evening, and I read the lesson again a couple of times. It helps me. It really helps me to do that, and what other valid reason do we need to study the Course. It helps us. It keeps us at peace. It gives us strength. It gives us courage to keep walking through the illusions that seem to be out there. Another passage that really helps me say’s “You cannot distinguish between advance and retreat. Some of your greatest advances you have judged as failures, and some of your deepest retreats you have evaluated as success.” (Tx.Or.Ed.18.41) I had this tendency to think of that flush of enthusiasm that I had at 28, 29, 30, 31, 32 – that enthusiasm about the A Course In Miracles – I thought that was my success with the Course. My sometimes doubting the Course, at this phase, I can think of as my failure of the Course, but this says that I can’t really judge these things. It’s probably the reverse. I was probably retreating when I thought I was knowing so much because I was not in a questioning mode. I am probably advancing now because I am questioning everything, and I am willing to know all that I don’t know. That youthful optimism is a early season, but this new intensity of my practice is a later season. Possibly I am learning more than I ever learned in the past. I think that I have done that. I think I have recognized that my mind is not in my body. There are many experiences that show me this. That quotation also has another interesting idea. The innocence of the mind is in the recognition that the mind is not in the body. That is where healing comes from. So, I just have another level to go with it. I only have to accept that I am not quite there yet. I have to accept that I still must have a lot of beliefs that my mind is still in my body. Possibly, I am not as innocent as I think I am. Another thing that comes to mind is many people interpret the body healing passages is metaphorical. There are a lot of A Course In Miracles teachers that teach this. They don’t take the body healing passages literally. Sometimes I wonder if I am moving more in that direction. Am I moving more in the direction of taking these quotations more as a metaphor and not taking them as literal as I did in my youthful season? When I ask this question to the Holy Spirit and the answer is “No.” I actually still do believe the literalness of the Course. I don’t think that it’s speaking as a metaphor, but it’s me. I am just going through my own seasons of opening up to it. This article appeared in the January 2010 (Vol. 23 No. 11) issue of Miracles Monthly. Miracles Monthly is published by Community Miracles Center in San Francisco, CA. CMC is supported solely by people just like you who: become CMC Supporting Members, Give Donations and Purchase Books and Products through us.